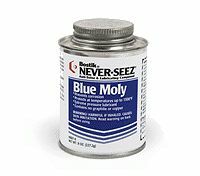 Never-Seez Blue Moly lubricant is designed for industrial applications requiring non-destructive assembly and disassembly where combinations of high loads, high temperatures and low speeds are encountered to reduce friction during the assembly of press-fit components. This multi-purpose extreme pressure anti-seize lubricant contains a high concentration of molybdenum disulfide. Especially effective under extreme pressures involving heavy loads and slow speed resulting in boundary lubrication conditions. Never-Seez Blue Moly withstands pressures to 300,000 psi and temperatures up to 1500°F. Suggested applications: Metal fittings, aircraft components, valves, stainless steel fasteners and slow moving parts, automotive engine bolts and body fasteners, stainless steel flange and pump bolts, chemical processing machinery, gasket dressing, assembly of dissimilar metals.